On March 31, 1908, U.S. Patent No. 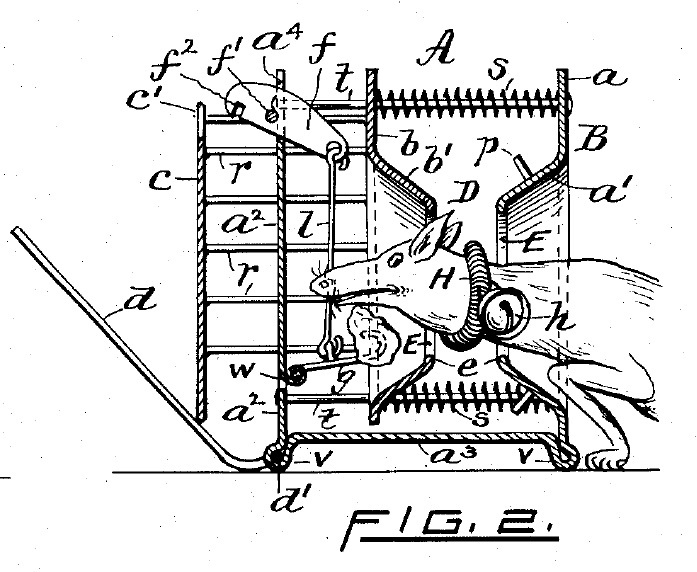 883,611 issued to Joseph Barad and Edward Markoff on a Device Employed for Exterminating Rats, Mice, and Other Animals — a better mousetrap! It puts a belled collar on the vermin so the cat can catch it. On March 30, 2004, U.S. Patent No. 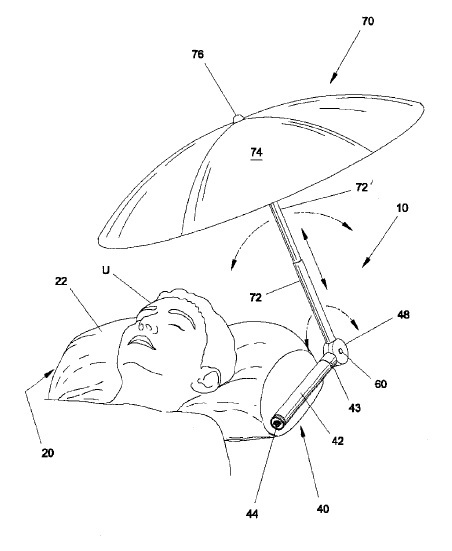 6,711,769 issued to Marielena Jane-Prats on a Pillow with Retractable Umbrella – perfect for spring break. On March 28, 1905, U.S. Patent No. 785,803 on the Art of Transmitting Intelligence, an early form of wireless communication. On March 26, 1845, U.S. Patent No. 3,965 issued to William Sheout and, Horace Day on an Improvement in Adhesive Plaster — a precursor to band-aids. On March 25, 1902, U.S. Patent No. 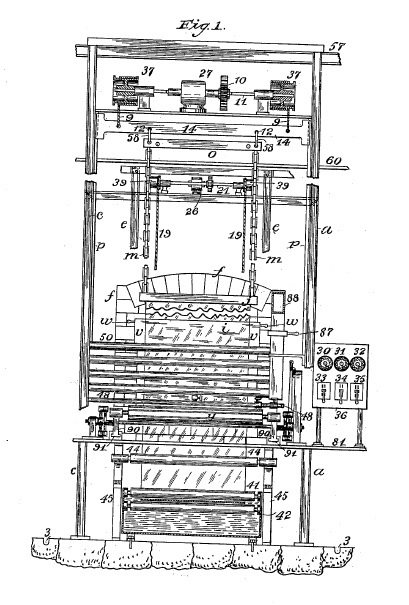 696,007 issued to Irving W. Colburn on a Glass Working Machine for making glass sheets. 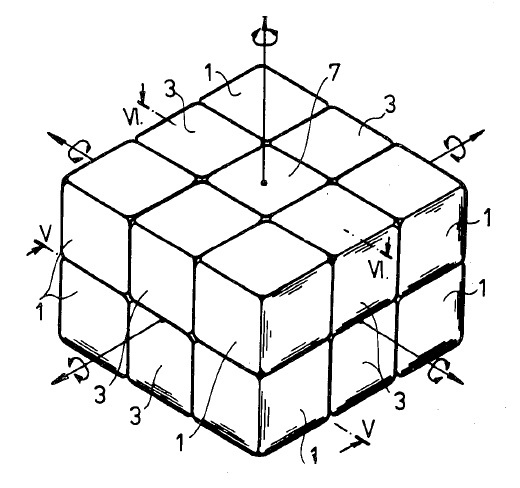 On March 24, 1959, U.S. Patent No. 2,879,439 issued to Charles H. Townes on Product of Electromagnetic Energy (the MASER), for which he shared the 1964 Nobel Prize in Physics. In Shaw Industries Group, Inc. v. Automated Creel Systems, Inc., [2015-1116, -1119] (March 23, 2016), the Federal Circuit affirmed in part, vacated-in-part, and remanded the USPTO’s final written decision regarding claims 1-21 of U.S. Patent No. 7,806,360 relating to “creels” for supplying yarn and other stranded materials to a manufacturing process. Shaw challenged the Board’s institution decision that refused to consider one of the proffered grounds of unpatentability as redundant. The Federal Circuit noted that the Board did not consider the substance of the cited reference, or compare it to the other cited art, nor did the Board make specific findings that the grounds overlapped or even involved overlapping arguments. Instead the Board merely denied the ground as redundant. While pointing out that it may not agree with the Board’s handling of the Petition, or that the Board’s handling was more efficient, the Federal Circuit said it had no authority to review the Board’s decision not to institute. Shaw persisted and requested a writ of mandamus, but the Federal Circuit found that Shaw had not shown it was entitled this extraordinary remedy, rejecting the Shaw’s argument that it had no other adequate means to attain the desired relief, because it would be estopped to raise the redundant grounds that the Board refused to hear. The Federal Circuit held that §315(e) would not estop Shaw from re-raising the redundant grounds in either the PTO or the district courts. The Federal Circuit said that both parts of § 315(e) create estoppel for arguments “on any ground that the petitioner raised or reasonably could have raised during that inter partes review.” Shaw raised the redundant ground in its petition for IPR, but the PTO denied the petition as to that ground, thus no IPR was instituted on that ground, and the IPR does not begin until it is instituted. This language does not appear to be limited to grounds that are not instituted for redundancy, and thus would also apply to grounds that the Board finds did not meet the or the “likelihood of success” and the more rigorous “more likely than not” standards of IPR and PGR proceedings. It is conceivable that the Federal Circuit could later distinguish between grounds rejected on their merits and grounds merely found redundant, but their holding that there is no estoppel on grounds that are not instituted appears straight-forward and unambiguous. Thus a petitioner may be able to preserve grounds by mentioning them, but not adequately supporting them, the resulting denial of institution protecting the petitioner from any estoppel effects. Finally, the Federal Circuit held that it lacked authority to review the Board’s decision that the petition was not barred pursuant to 35 U.S.C. §315(b). Leaving the Board’s curious rule that a complaint served but later dismissed does not count as a complaint, completely unreviewable. 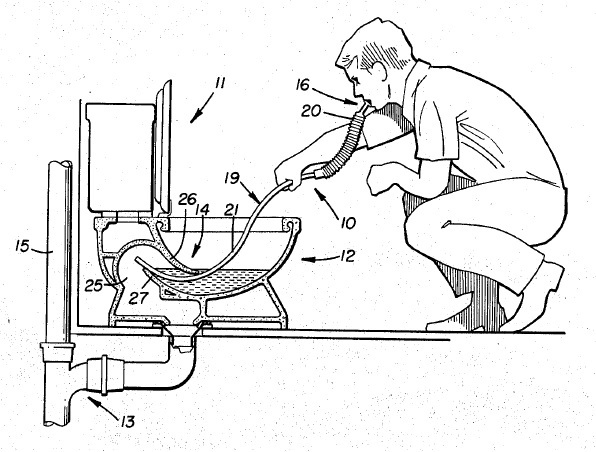 On March 23, U.S. Patent No. 4,320,756 issued to William O. Holmes on a Fresh-Air Breathing Device and Method. Although the title seems less than accurate, it offers a (slightly) better alternative to dying in a building fire. Mr. Holmes probably saw Towering Inferno (1974) one too many times.